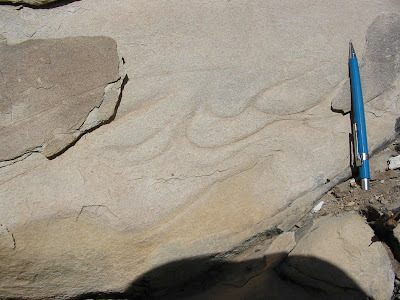 Today, we have another sedimentary structure commonly seen in turbidite successions. The features above that look like flames are called … drum roll … … flame structures (brilliant!). Right in the center of the photograph notice the slightly darker and curved lines in the rock. They meet upwards at a tip and are pointing to the right. Flame structures form as the upper part sinks into the underlying sediment, often referred to as ‘loading’. This loading commonly occurs in localized pods and then the sediment in between gets squeezed up a bit. The directional component of this (the tip of the ‘flame’) is produced because there is still some current strength which shears the material just slightly before everything comes to rest as a deposit. So, in the case above the local current direction was left to right. How does loading occur in the first place? Firstly, the underlying bed cannot be completely dewatered. That is, it is still a mixture of sediment and water is likely in a ‘soupy’ state. Secondly, there needs to be a density contrast. The overlying material has to sink into the soupy bed to be able to displace the material like this. You may have seen flame structures before where coarser material (usually sand) sinks into much finer-grained material. But, in this case all the material is sand of similar grain size. The density contrast is set up because the overlying sediment has much more water in it still. Remember, sediment gravity flows are a mixture of sediment in suspension and water….this is very different than fluid flows where the sand is transported as bedload. In this case, if you were to examine this deposit laterally away from where this photo was taken the loading and flame structures disappear and the bed is completely homogeneous. This is just a localized structure within a bed and not a boundary between discrete events. Turbidity currents commonly exhibit ‘surging’ behavior. As the flow moves down-slope it will begin to separate into multiple sub-flows. Or so we think….our knowledge of how these things actually work is incredibly limited. UPDATE: Check out Hindered Settling’s post about flame structures here. ← Where on (Google)Earth #27? So is that photo from the Gualala block? German Rancho Formation? So, how reliable do you think flame structures would be for indicating flow direction, assuming you could determine the geometry of the feature in 3D as opposed to a random outcrop slice?